Three posts from November 2008.
see "Rules and Beer" from the 24th, and "Rules vs Trust" from the 22nd, etc. The connection should be clear enough. note taking. my comments elsewhere. neatened up a bit here. Rules vs Trust: Language always changes, so what are rules? Communication isn't about ideas, it's about people. Something Leiter et. al don't understand. A judge is an orator, a public speaker trying to win over his audience, or at least gain their respect for the possible logic of his decision even if they disagree. The purpose of law is not the search for truth but for for social stability and peace. The truth itself is unknowable. The foundational Ideological commitment in a democracy is the commitment to getting along. Truth is a function of the social and any conclusion must be socially acceptable. Dworkin's Hercules is a fictional character, like Socrates. Laws must be, or appear to be, non-contradictory. Principles are under no such obligation. Legal decisions are public performances in defense of one description of an illusory seamless web: our mythmaking of ourselves and our processes. Positivists are interested in rules, in numbers and grammar, and of course they mythologize their own positions. Anything in language will be contextualized by history. American legal realism manifests itself as a datable aspect of an era, as does post-war American rationalism. There is no equivalent in physics or mathematics and to say otherwise is to analogize words as numbers, and perception as Platonism. Naturalized epistemology is an inappropriate philosophical basis for a democracy. The only foundation in law in a democracy is theater. Again (a reminder): If 1 is next to 2, 2 next to 3, 3 next to 4, and 4 next to 5, is 1 therefore next to 5? No. Numbers in their relations to one another neither evolve or devolve. Language always changes. Law in a democracy is one aspect of the public marking/manifestation of change. The question in TVA v. Hill was whether the courts or the legislature had the right to make a decision and under what terms. Is it permissible in our system, as we define it at this time that the courts have such authority? The question is: can we as we imagine ourselves now, get there from here? Social truth not objective truth. The argument in law is a public argument over the definition of our language and ourselves in the present, not an argument over external objective truths. 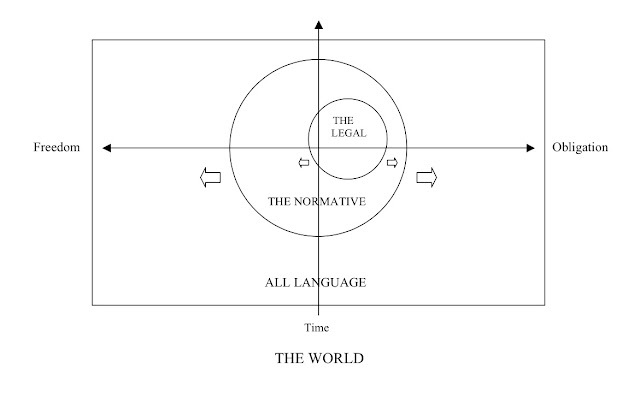 The only natural law is the law that says language is and society are artificial. On general questions: Democratic justice is not justice, but one definition of justice. Justice or law can be defined as a language structure perceived commonly as manifesting a stable order in which things and people have a specific role and place. Law is a roadway and a map to the world. There is law and justice in a monarchy as long as people perceive it. Barbarism is society without law. Fascism is society of the hypocritical pretense of law: law as kitsch. The mechanisms of such an order make it far more violent than simple barbarism. This is all so basic it depresses me to need to form it as an argument.